GROHE EcoJoy provides all the comfort you would expect of a GROHE shower while reducing your water consumption by up to 40%. This water-saving technology not only has a positive environmental impact, but will help to reduce your household bill, too. The GROHE DreamSpray technology turns your daily shower into a luxuriously relaxing experience. The advanced engineering of the shower head ensures a balanced flow of water from all nozzles, whatever spray pattern you choose. Limescale is a no longer an issue with our SpeedClean nozzles: thanks to the integrated anti-lime system, you will find the nozzles of your GROHE shower head super easy to clean. To remove any limescale residue from the flexible silicone nozzles, simply wipe them off with your hand. A strong insulation of the water guide inside the shower prevents its surface from heating up, so it will never be too hot for you to touch. At the same time, this serves to protect the finish of your GROHE shower, further enhancing its great durability. Enjoy the relaxing Rain Spray sensation on your skin. This soft and delicate spray pattern reminiscent of warm summer rain will soothe your body and mind, washing away any tension and stress. Perfect looks and a perfect showering experience. 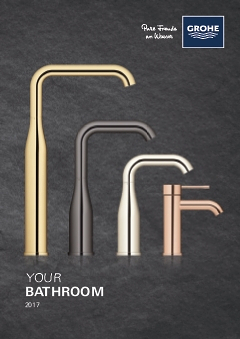 Luxury fittings & showers for exceptional bathrooms.